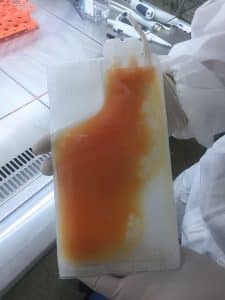 Freshly collected cord blood plasma from healthy newborns with heparin (not more than 2000 EU per one collection of cord blood). The blood is screened according to EU requirements for all infectious diseases transmittable by blood transfusion. It is 0.22 μm sterile filtered and freezed immediately after collection and pooling. Our cord blood plasma is aliquoted in 100 ml blood transfusion bags and deep frozen and stored in liquid nitrogen. Shipped on dry ice. Quality certificate is issued with each batch of plasma. Under special request, not pooled plasma is available. Please contact us for more information about pricing and ordering thus product. Human umbilical cord plasma proteins revitalize hippocampal function in aged mice. Ageing, neurodegeneration and brain rejuvenation. Sinha M, Jang YC, Oh J, Khong D, Wu EY, Manohar R, Miller C, Regalado SG, Loffredo FS, Pancoast JR, Hirshman MF, Lebowitz J, Shadrach JL, Cerletti M, Kim MJ, Serwold T, Goodyear LJ, Rosner B, Lee RT, Wagers AJ. Science. 2014 May 9;344(6184):649-52. doi: 10.1126/science.1251152. Epub 2014 May 5.